Robert Ceely was born in 1930, and grew up in Williamstown, Massachusetts. He spent his youth playing trumpet, delivering newspapers, and listening to “Big Bands” performing at Williams College dances. After graduating from Williston Academy he attended Hobart College and Williams College for one year each. After which he went to the New England Conservatory where he studied with Francis Cooke. Further studies were with Darius Milhaud and Leon Kirchner at Mills College, and with Roger Sessions. Edward Cone and Milton Babbitt at Princeton University. In 1963-64 he worked in the Electronic Music Studio in Milan as guest of The Italian Government. His compositions include solo, chamber, and orchestral music as well as music for tape alone and tape with instruments. His ballet “Beyond the Ghost Spectrum”, with choreography by James Waring commissioned by the Fromm Music Foundation, was performed at Tanglewood in 1969 with Michael Tilson Thomas conducting. His opera” Automobile Graveyard”, after a play by Fernando Arrabal, was presented at the New England Conservatory in 1995. He has received grants from the National Endowment for the Arts, the Ditson Fund, the Manon Jarrof dancers, the Massachusetts Arts Council, the Brookline Arts Council the Fromm Music Foundation and others. In 1995 he was a recipient of an outstanding alumni award from the New England Conservatory. 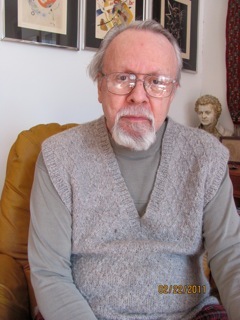 He has taught at the Naval School of Music, The Lawrenceville School, Robert College in Istanbul, and for thirty-eight years at the New England Conservatory where he established and directed the Electronic Music Studio and taught composition. In 2003 he retired from teaching, and presently devotes all his time and energy to composition.